^ 楊惠南. 《金剛經》的詮釋與流傳. 中華佛學學報. 2001, (14). ^ 4.0 4.1 4.2 善慧光 蓮花藏. 金剛經梵文注解 (PDF): 4. ^ Yongyou Shi. 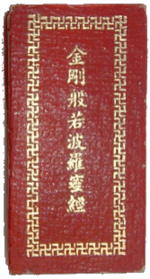 The Diamond Sutra in Chinese Culture. Buddha's Light Publishing. 2010: 6–7. ISBN 978-1-932293-37-1. 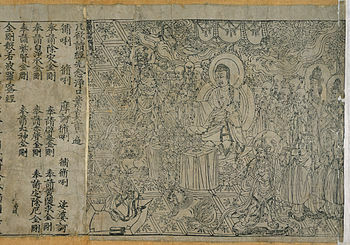 ^ BHAISAJYAGUR AND VAJRACCHEDIKA SUTRA. The Schoyen Collection. ^ 許洋主; 如實佛學硏究室. 金剛般若波羅蜜經: 新譯部, 集註部. 台北市: 如實出版社. 1995年. ISBN 978-957-99454-0-0. ^ 印順法師. 〈金剛般若波羅蜜經講記 懸論〉. 《般若經講記》. ^ 金剛般若波羅蜜經 - 维基文库，自由的图书馆. zh.wikisource.org. [2017-10-17] （中文）. ^ 29.0 29.1 The Diamond Sūtra, Translated by Charles Muller, "Why is this so? Subhūti, If a bodhisattva abides in the signs of self, person, sentient being, or life-span, she or he is not a bodhisattva." ^ The Diamond Sūtra, Translated by Charles Muller, "All conditioned phenomena/ Are like a dream, an illusion, a bubble, a shadow /Like the dew, or like lightning /You should discern them like this." ^ The Diamond Sūtra, Translated by Charles Muller, Diamond Sūtra "More important, though, is the basic resonance of the text's message with a core aspect of Chan doctrine/practice — the theme of "non-abiding." Non-abiding, in a Buddhist, and especially a Chan context, refers to the continual practice (i.e., not just while one is sitting in zazen) of being aware of the stoppings and goings of the mind, and avoiding being tricked and ensnared by the web of mental constructs that one continually weaves for oneself." ^ 中国科学院科普中心. 雕版印刷技术的发明. [2009年6月12日] （中文（简体）‎）. ^ 李奭學. 中外文學關係論稿. 聯經出版. 2015-01-31: 5. ISBN 978-957-08-4527-3. ^ 唐代敦煌金剛經變研究 (PDF) (碩士). 南華大學: 33.